“Military Reform” in Washington usually means “Acquisition Reform.” There is a lot of talk about it on Capitol Hill and in the Pentagon. Enough think-tank papers have been written on the subject to clear whole forests. But of the myriad options out there, one has escaped notice. Performance bonds—money put up by a contractor as insurance to the buyer to make sure the job is done on time and to specifications—are already required for federal building projects under the Miller Act. Prime construction contractors have to furnish a surety to the government to ensure their work is completed properly and to guarantee all subcontractors get paid should the firm go out of business. And they’ve been used with some success in overseas defense procurement contracts. The same idea could potentially be applied to a weapons acquisition project to protect the government’s (and the taxpayer’s) interests. But it has so far been overlooked during the sometimes desperate search for solutions to the Pentagon’s dysfunctional buying process. One key selling point for this idea is that provisions for using performance bonds for DoD acquisition already exist. As is usually the case, improving discipline in weapons spending doesn’t require new rules but using the rules that already exist to better effect. The collapse of the Soviet Union and the end of the Cold War put defense contractors across the world in a tight spot. The two greatest superpowers were no longer casting nervous glances at each other across the Fulda Gap. For a time in the 1990s, there seemed to be little interest among most nations to arm themselves to the teeth. Weapons manufacturers found themselves with plenty of products to sell, but with very few people interested in buying. Those nations that were still in the market for high-end military equipment were in an excellent position to extract the best terms possible. Officials from the United Arab Emirates understood this and encouraged a rigorous competition between the world’s defense contractors when they said they wanted to purchase new fighter planes. In doing so, they were able to acquire the planes they wanted—world-class fighters with cutting edge offensive and defensive electronic systems—at the price quoted to them and on the challenging delivery time line specified when the contract was signed. Contractors were also able to assure them that the plane's stressing performance requirements would be met and that the Emirates wouldn't have to pay for any promised capabilities that went undelivered. When the UAE began shopping in earnest in the early 1990s, several international firms offered designs including the Eurofighter Typhoon, the French Rafale, and the Boeing F-15E. 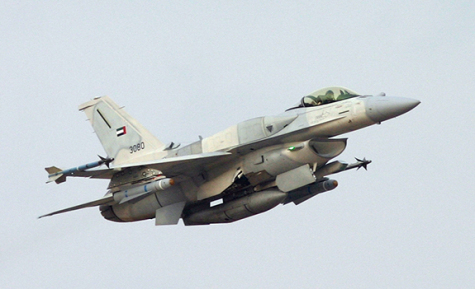 But the Emirates liked one design in particular, Lockheed Martin’s F-16. They first sought to purchase them in 1981.
for the full story, with hypertext links, on the POGO website. (EDITOR’S NOTE: One can only imagine how troubled acquisition programs, such as the F-35 fighter or the Littoral Combat Ship, would have performed had their contractors had to post performance bonds. Instead, the Pentagon routinely breaks its own acquisition regulations, for example by awarding low-rate initial production contracts for the F-35 fighter before the Milestone C decision, or by making advance cash payments to Lockheed Martin for the same notoriously underperforming program.